A year has gone by since the kick-off of our first Growth-Driven Design project. Was it worth it? Was it everything we promised the client it would be? You bet it was. 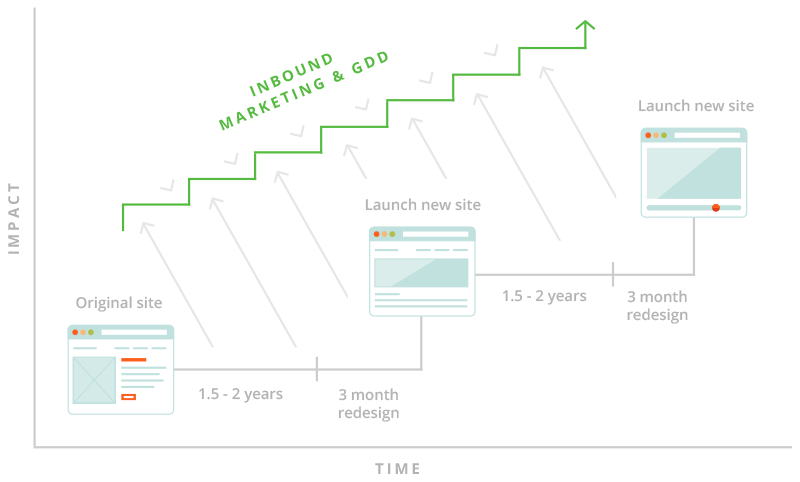 Here's the quick elevator pitch on Growth-Driven Design (GDD) if you've never heard of it: GDD is a totally different way to launch a new website. The traditional "project-based" approach treats your website as a finite project where you try and get everything done in a 3-4 month window. Once the site is launched, any new ideas and revisions end up shelved until the next website overhaul a few years down the road. Counter to that methodology, GDD uses an organic or "agile" approach to web design where you create a "launch pad" website as fast as you can so you can get quick wins from the new website via SEO and conversion optimization. Once launched, you step back and see what works and what doesn't by observation of visitor data and other metrics. You then build upon the launch pad website to make smaller changes that improve the performance of your website. 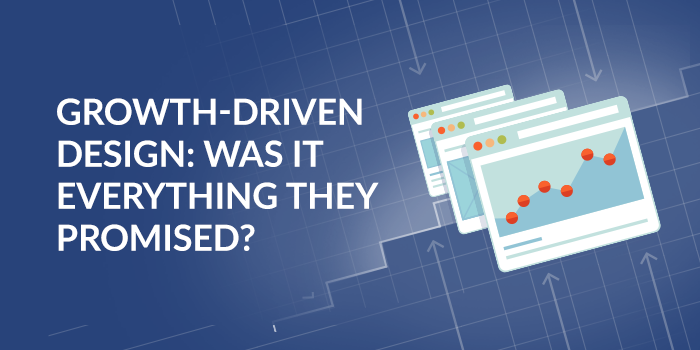 Our partners at HubSpot coined the new term Growth-Driven Design, but we were no strangers to the concept as we've been watching Amazon and many other industry leaders using this process for years. HubSpot and GDD go hand-in-hand because they both use data to drive sales and marketing decisions. We immediately identified a client in need of just this approach. 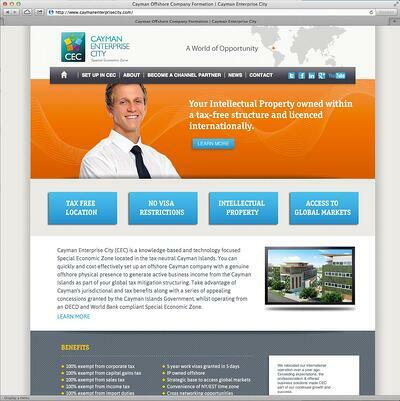 Cayman Enterprise City (CEC) is a Special Economic Zone located in the Cayman Islands. CEC offers an opportunity for companies to move into a pro-business offshore environment in which they can grow their company, protect their intellectual property, and benefit from a tax-neutral jurisdiction - all while living in paradise. CEC has been in operation for about 5 years and competes with zones in Dubai, Ireland, Singapore, the Bahamas, etc. with similar offerings. As a relative start up, CEC realized after launching their 2nd website in 4 years that their ideal client, and thus their corresponding marketing materials, voice, and website content, were all changing faster then they could have ever imagined. With potential clients all over the world, each with unique business needs, it was essential that CEC's website clearly portrayed their offerings, selling points, and competitive advantages. Like many of our clients, CEC is held to very strong brand standards and website changes go through several internal and external stakeholders before they are approved. Large website design overhauls often get stalled as approvals go back and fourth until disappearing in someones inbox. We had already identified HubSpot as a fit for CEC because they needed a way to centralize all their marketing and sales activities into one platform. We also knew Inbound Marketing was the right approach to drive more traffic to their website. GDD was the icing on the cake because it offered a systematic approach to re-launch their website quickly on HubSpot while providing the ability to use all the great sales and marketing data that they had been collecting. Launching quickly meant that we'd be able to fix several navigational and UX issues right away. It also allowed us to easily create more effective CTAs and compelling lead-generating forms - all of which led to higher conversion rates and less bounces immediately after launching. 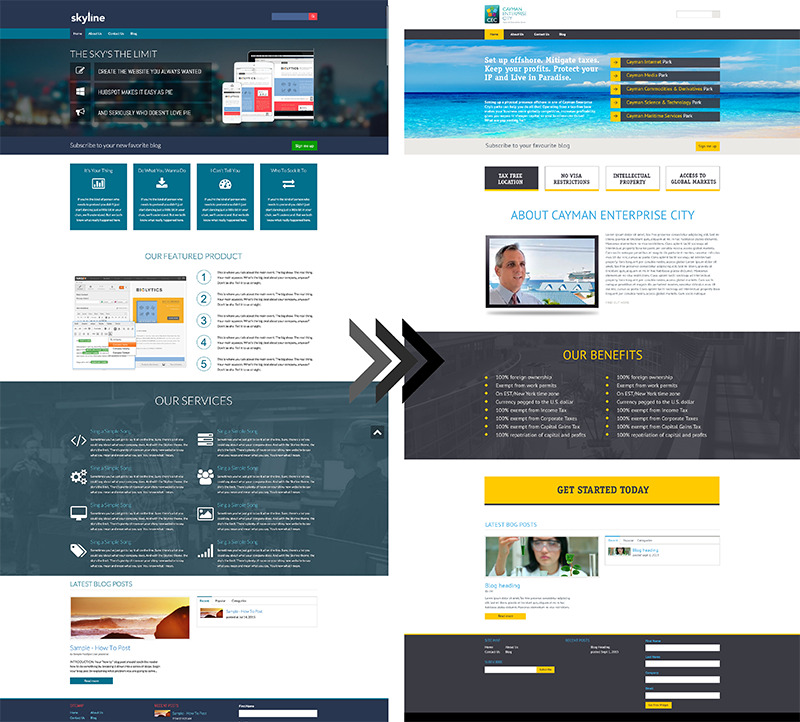 It even changed the entire way the client approached their content. Instead of worrying if it was "perfect" - the emphasis was on getting good content up quickly, but then using data and sales experiences to refine it over time. We also had the benefit of these small changes getting approval quickly from all stakeholders, which ensured that they got implemented and not lost in an email chain. Since this was going to be the 3rd redesign in 5 years, we wanted to make sure we were not back at the table again in 6 months for the 4th redesign. A significant amount of time was spent diving into the data from their existing website. What were the top converting pages? What content was most important to visitors? What countries were visitors coming from? These answers told us a lot about what was important in this redesign. We also defined our goals for the new site. Of course we wanted more visitors, leads, and customers - so we focused on ensuring our content strategy would be nimble and organic going forward. We wanted to make sure we could change our messaging based on our personas and even visitor location, so we also opted to keep HubSpot's Smart Content in our toolkit. Smart Content would be a game changer. We then developed CEC's buyer personas so that we could hypothesize the content that was most important to each persona. It was vital that each unique visitor got the right message. We talked to both sales and marketing teams to find out who the ideal CEC client was, their commonalities, objections, and ideal product solutions. Completing our initial picture of CEC's personas (something we've revisited several times over the year) led to building our website and content map and allowed copywriting to begin. Only about 2 weeks were spent on the strategy and planning phase because we knew we were going to constantly revisit everything once the new site was live. Traditional design projects can sometime take months of planning before pen ever hits the paper! Design is always important to every website. Visitors judge your website in milliseconds and devise notions about you before they've read a word. We needed a balance between form and function because sales are what really matter at the end of the day, and the faster we could get a new website up the faster we could increase sales. Repurposing an existing HubSpot theme allowed us to integrate their custom design into HubSpot's COS in days instead of weeks. We were even able to use the structure of many of HubSpot's email and other templates. This method also afforded us the ability to start importing and creating content immediately since we could work within the base template while the design was being finalized and implemented. From the end of the strategy phase, it only took 4 weeks to get the launch pad site live by staying focused on the important goals and must-haves for the launch. We almost couldn't believe the numbers at first. In the first full month after launch, the number of leads generated by the site nearly doubled! Traffic was up 20%. Time on site was up. Bounce rate was down. We were beside ourselves with excitement! The first month proved how much value GDD can bring to a website relaunch. Had we gone the traditional route, it might have taken 6 months from start to launch. With GDD, it took 6 weeks. That meant we had 4.5 months with more visits, higher conversion rates, and more leads. For the last 9 months we've been in a continual cycle of improving the design, content, SEO, CTAs, forms, navigation, and other key elements based on traffic/user data and feedback from CEC's sales and marketing teams. As we learn from each cycle's metrics, we develop new ideas and strategies and then deploy them on the website as quickly as we can and then measure the results. We've done this over and over again and sharpened the marketing message and effectiveness for their entire site. As CEC discovers more and more unique sales pitches to different jurisdictions, we can continue to refine and perfect the message to website visitors. We've also been able to remove entire sections of the website that we discovered were no longer applicable to CEC's direction or that personas just didn't care about. The improvement cycle of GDD also really syncs with SEO efforts. We're able to incorporate ideas from sales and marketing as well as data from visitors and search rankings into a single strategy, which makes everything we do more effective. Because we can see exactly which changes make the biggest impact, we're able to keep and expand on those while dumping the changes that are not bringing any improvement. Knowing exactly which pages the contact requests are coming from and the path visitors took to get there has helped to guide the strategy for all our content generation. Leads Are Even Higher Quality Than Before GDD! While improving the website with Growth-Driven Design, we've seen amazing results, and since we know which changes are driving those results, we've been able to improve our social media marketing and paid search campaigns for this client as well. The reverse of that is also true - using the GDD approach to this website has allowed us to easily add more content and change hierarchies based on opportunities that we identify via our paid and social campaigns - an option that isn't always available in the typical website design process. President of Meticulosity and Serial Entrepreneur.